An expectation of the Common Core Learning Standards is that teachers differentiate their instruction to meet the needs of all children. This includes special education and general education students, as well as English-Language Learners. One of my favorite technology tools, the QR code, can be used to meet the needs of a variety of students in one classroom. Teachers can create QR codes for differentiated instruction activities. A QR (quick response) code is similar in principle to a barcode -- a matrix image that can be scanned using a mobile device like a smartphone or a tablet with Internet access. There are many free QR Scanner apps that are perfect for classrooms using both iOS and Android devices. When children scan the code using the camera on their tablet, they'll be taken directly to a website. In a previous blog, I shared some of the reasons why I love using QR codes in my classroom. In a differentiated classroom, children are working in groups based on level, interest or learning style. Teachers design tasks that meet the needs of their students. QR codes can be used to organize a differentiated classroom in two different ways. One option is to make QR codes that send each student in your class to the same website and create activities that are differentiated. For example, all students will scan a code that takes them to a news article from USA Today on polar bears. You can then create three different sets of questions for students to answer about the article based on their level. Having students all scan the same QR code to visit the same website will provide the appearance that all students are doing the same work even though their activity sheets might be different from the ones their neighbors are using. A second option for using QR codes to differentiate instruction is to create different codes for different groups. For a social studies lesson, you might want your students to scan a set of codes that takes one group to National Geographic's website, another group to an image of a world map, and a third group to an encyclopedia entry about explorers. You can create three different sets of QR codes to distribute to students or use a QR code generator like Visualead to create codes that have similar colors or background images. One group can scan the code that looks like a tree, while another can scan a code that looks like a globe -- or any picture that you choose. Not only is creating colorful QR codes an easy way to have students break up into differentiated groups, but this tool can also be used to create stations in your classroom. So the next time you want your tech-enabled students to work on a differentiated task, try sending them to the same website with different activities to complete. Another option is to create unique QR codes for different students (maybe with colors or images) that will help separate children into leveled groups without making anyone feel singled out. 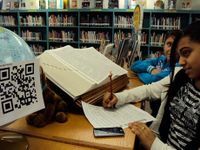 Have you used QR codes in your classroom? Share some of your favorite ways.